Barbara Arntsen. 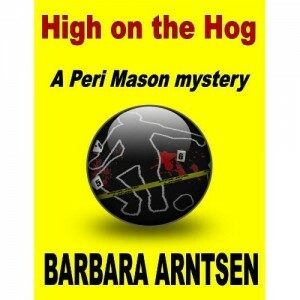 High on the Hog: A Peri Mason Mystery. United States: CreateSpace, 2012. Reporter Periwinkle “Peri” Mason is looking forward to a relaxing Carolina fall. Earlier in the year she narrowly avoided becoming a victim while unexpectedly solving a slew of murders on Myrtle Beach, and in her opinion, once was enough. Unfortunately, the universe has other plans for the tough journalist from fictional Lofton, North Carolina. While walking along the Neuse River in Wayne County near Lofton, Peri’s spirited Jack Russell terrier discovers something truly grisly– a body floating in the shallows. The corpse is that of Curtis Ganner, who was missing for several days. Mysteriously, his truck was found miles upriver, making murder the likely cause of his demise. Curtis worked for the McKeel Processing Plant, which is one of the largest pork producers in eastern North Carolina. The plant’s human fatality rate begins to rise when another missing employee is also found murdered. When a third victim’s head is found among some porcine remains, Peri can’t help herself– she starts investigating. 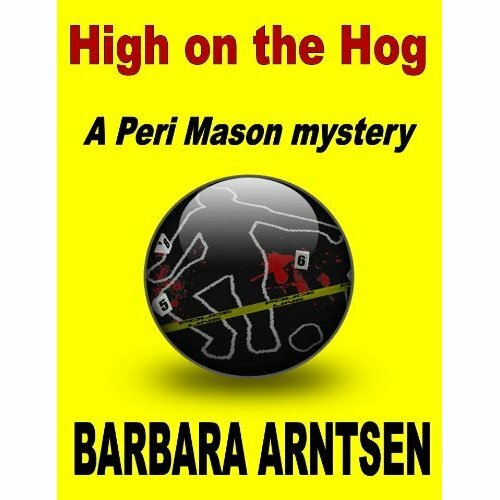 As she digs into the soft underbelly of the pork industry the intrepid reporter finds not only murder, but industrial espionage. Soon she is knee-deep in pig excrement (literally and figuratively), and more in danger than ever. Will Peri make it out alive this time? Marilyn Denny Thomas. The Gentile and the Jew. Enumclaw, WA: Pleasant Word, 2005. The rules of dating dictate that talk of money, politics, and religion is off limits. However, these complex topics must be addressed if a long-term relationship is the goal. For UNC graduate students Mike and Carrie, the significance of these issues, particularly that of religion, becomes apparent when the couple joins each other’s families for Thanksgiving. Mike, who is Jewish, feels uncomfortable during the blessing before the feast. Carrie receives a cold reception from Mike’s family, particularly his mother who believes that her son should not waste his time with a Gentile. This tension results in the two breaking up with each other; however, they are still very much in love and soon reconcile. Mike’s mother, Rachel, the daughter of Holocaust survivors, has always wanted to go to her parents’ hometown in Romania to find information about her family. Because she knows so little about her relatives, believing most of her kin perished in the Holocaust, Rachel firmly believes that her children should marry Jews to keep the tradition alive. When she goes to Romania, however, she discovers that not only does she have living relatives, but that some of her ancestors were Messianic Jews. As Rachel explores her family’s past, her expectations of a suitable match for Mike change. Although the two families come from very diverse backgrounds, they are able to embrace their differences and acknowledge the deep love that Make and Carrie have for each other. Marilyn Denny Thomas. Sweet Beulah Land. Longwood, FL: Xulon Press, 2008. This novel opens with the buzzing activities of Election Day in Beulah, North Carolina. As Marilyn Denny Thomas describes that day in 1900 and the days following, she introduces the reader to a wide cast of characters. There are the members of the Gresham family (Jeb and Sarah Jane and their five daughters) who are well-established in Duplin County. They have formed strong bonds with their friends, such as the Thomases and the Williamses, and relatives (some of whom spell their last name Grisham or Grissom) in this tightly knit community. Residents of Beulah share their many joys, such as marriages, births, and successful tobacco crops as well as many disappointments, such as wayward family members, unfulfilled dreams, and deaths. Beulah is not unlike other small towns; it has its share of darkness, such as the murder of a former slave, and as well as shared curiosities, such as the total solar eclipse that townspeople witnessed as they collected tobacco from the fields. Thomas exposes the happenings of a small southern town at the turn of the century.